Tanzanite Engagement Rings, The Perfect Gem For A Wedding Or Engagement Ring. All of us know the symbolism of an engagement ring, the ring is worn to celebrate a solemn commitment between two individuals. After dominating the bridal jewelry scene for many decades, thanks to some high powered marketing hype, diamonds are now a 'not so important' feature of engagement and wedding rings. The stagnation that has descended on the price movement of diamonds, is proof of this fact. Given the importance of an engagement ring, the jewel has maintained a steady demand with colored gemstones, now playing an increasing role. The spectacular world of natural colored gemstones is wide and deep, some gems like tourmaline can be found in a range of colors and others like emerald, sapphire and ruby have been known for many centuries. The quick burst to fame of tanzanite, a gem that has been introduced to the world of jewelry and gems as recently as in 1967, is like narrating a fairy tale story. Tanzanite engagement rings are surely appreciated for their amazing beauty but, the gemstone has a lot more that makes it a perfect choice for engagement rings. Let us briefly enumerate the highlights for recommending a gold, sterling silver or platinum tanzanite gemstone engagement ring. Gorgeous violet to blue-violet color, exotic and stylish. Rare gem, found only in a small stretch of land in a remote part of Tanzania. Verified to be rarer than diamonds, probably around 1,000 times rarer. In general, shows better clarity than ruby, sapphire and emerald. The gorgeous color, looks great in gold, silver or platinum - all metal colors. Good quality tanzanite is much more reasonably priced as compared to ruby, sapphire and emerald. Fits in with the mood of an engagement - rare and found only in 1 single place. 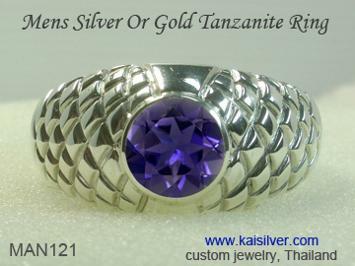 Kaisilver custom cuts each piece of tanzanite assuring, your choice of shape, size and cutting style. We can craft your tanzanite engagement ring in gold, silver or platinum - your design or ours. We source our tanzanite directly from the miners in Kilimanjaro, our procurement strategy is to pick the best pieces available in each price range. 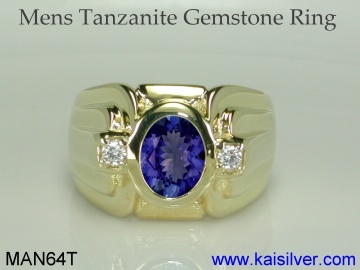 Kaisilver gem experts have a thorough understanding of rough tanzanite, this puts us at an advantage over other gem buyers in the same locality. 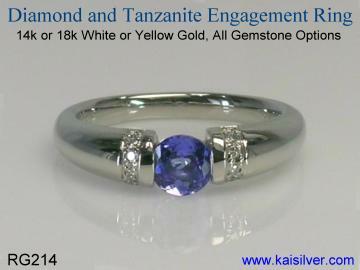 So while you are assured of nothing but, natural tanzanite gems, you also get good value in terms of money spent. At this point of time, heat is the main form of treatment for tanzanite rough and this, is accepted by all gemological experts. Since we perform the heating process in our own, critically controlled ovens you need not worry about any unacceptable forms of gem enhancement procedures being applied to the stone. The color of rough tanzanite will change to the exotic violet blue range only after, the heating process is complete. Talent and experience allow our buyers to make impressively accurate predictions of the likely color response, of each piece of rough. Cracking and breaking are all possible during the heating process and once the stones pass through this stage, you get stable tanzanite that is sufficiently durable to wear and set in finely crafted gold and silver jewelry. This high degree of customization that includes every stage of gem procurement, heating and cutting makes it unnecessary for us to place any restriction on your choice of gem shape, size and cutting pattern. So if you need a white gold tanzanite engagement ring, with an 8mm cushion shaped gem that has a multi faceted (checkerboard) cut on the face of the stone, all you need to do is request for it. We can accommodate just about any requirement that you might have for your gold, silver or platinum engagement ring. Jewelry buyers are becoming increasingly conscious about the gems and jewelry that they buy, this means that importance is given to features that go beyond mere external beauty of the jewels. The highlights of tanzanite engagement rings as mentioned above, is a big reason for young couples to choose the gem to celebrate the important event in their lives. The guy is about to make a life long commitment with the only girl that is right for him, someone whom he dearly loves and cares for. The element of rarity combined with the 'sole source' for the gemstone, makes a platinum, gold or silver tanzanite engagement ring truly special. It is a great idea for the wearer of the ring to know the background of the gemstone, they will better understand the choice of gemstone and appreciate its unique characteristics and features. An interesting question that we are often asked is whether, an engagement ring would be okay with absolutely no presence of diamonds. While opinions can differ on the answer, we will base our comments on actual trends and maintain that, diamonds are no longer considered to a necessity for engagement and wedding rings. The best thing would be for you to decide based on your comfort level but, no matter what you decide try your best to let the stunning tanzanite gem hold center stage. You could pick a tanzanite engagement ring design concept, where a few small diamonds add a hint of glitter. You could also try gems other than diamonds for the smaller stones, deep red rubies, pink sapphires or even white sapphires make interesting options. You can discuss such details with our support experts before, making a buying decision. Choose Kai Silver to craft your special ring and there will never be any limitation on design, gemstone or metal. However spend a moment to consider, the design that you choose for your tanzanite engagement ring. You want the ring to withstand prolonged and frequent use, so any features that make the wear more comfortable and stress free would be welcome. All our jewelry is crafted with metal weight that is optimized for the ring size and dimensions, this is one of the basic essentials for creating a jewel that is sturdy and does not bend or dent easily. Skilled craftsmen and expert gem setters ensure that, the gems and diamonds (if any) in your tanzanite engagement ring are set firmly and securely. Strict quality control measures are applied through every stage of production, this is to make sure that problems do not accumulate and compromise the beauty and durability of the jewel. Let us briefly explain the fine features of all Kaisilver custom jewelry including, platinum, gold or silver tanzanite engagement rings. No limit on choice of design, gemstone and dimensions. Available in 14k or 18 gold and 925 sterling silver. Gold color options are white, pink and yellow gold. You can request for 10k gold or platinum price quotes. All metal options are provided with good metal weight and workmanship. All gems procured directly from mines and custom cut by us. Each ring is crafted by some of Thailand's best craftsmen and artisans. Buying: You can pick a design from our website or request for your own design idea to be custom made. All the jewelry on our website, can be custom made in gold or 925 silver with your choice of gemstone. If you are interested in any of the tanzanite rings shown below, click the provided link to get complete details including pricing information for the jewel. We encourage you to discuss your requirements with our experts at sales@kaisilver.com Since you are never obligated to make any purchase from us, it is a great idea to get the benefit of our expertise. Production time for our custom made jewelry is around 4 to 6 weeks from the date, that we receive order confirmation with payment. We accept payment through Paypal and Western Union but strongly recommend that you choose Paypal. Shipments are made through FEDEX and we generally try our best to absorb this charge into our costs. In cases where this is really not possible, you will pay a shipping charge ranging from 35 U.S$ to 45 U.S$. The shipping costs if any, will be quoted well before you finalize the purchase, so there will be no surprises. A simple and elegant white gold tanzanite diamond engagement ring. Custom made in sterling silver or 14k and 18k, white, yellow and pink gold. 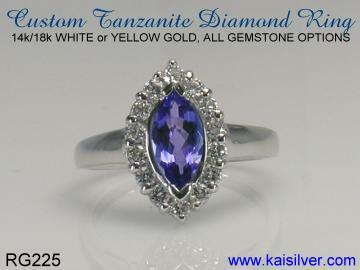 The modest gem size ensures that you get a good quality natural tanzanite gemstone at an attractive price. Slight glitter with the small diamond trimmings on either side of the round tanzanite gemstone, this engagement ring is comfortable to wear and easy to maintain. Available in all ring sizes ... more. With men taking an active interest in the jewelry that they wear, it is no surprise that the exotic tanzanite has impressed the male heart too. The MAN61 is a sturdy, durable and abundantly stylish tanzanite diamond ring for men. Fine quality craftsmanship, hand picked gems and sparkling diamonds are some of the highlights of this awesome men's tanzanite engagement or wedding ring in gold or 925 silver. We have full details for this men's ring ... more. To begin with tanzanite is one gem that has a strong following among both ladies and men. On the issue of whether men wear engagement and wedding rings, we have come to an interesting conclusion based upon our production reports. Men are increasingly wearing at one of the two rings. 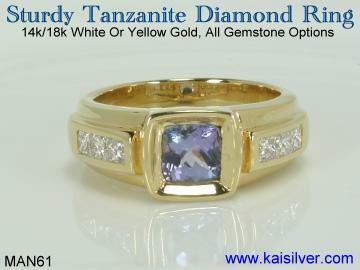 Keeping this in mind, we would surely recommend a fine gold or 925 silver tanzanite engagement or wedding ring for men. Men have always been comfortable with wearing 925 silver rings ... more. Men's engagement rings might not be very common but, men who do choose to wear them are quite specific and particular about style and trend. Here is a handsome ring that is sturdy, very modern and comfortable to wear. You could buy this tanzanite engagement ring for yourself or to gift it to your to-be-husband, the ring is awesome and will surely add a great touch to the formal suit or coat that is worn on the day of the engagement ceremony ... more. A statement making tanzanite engagement ring, fine craftsmanship and a gorgeous custom cut marquise shaped tanzanite bordered with a row of sparkling diamonds. Along with the trend for colored gems in engagement rings comes, a liberal selection of innovative and dazzling designs. Go for the classic appeal of a silver tanzanite ring or stay with the, gold and platinum tradition for your ring. Your choice of 14k and 18k gold or 925 sterling silver ... more. Taking the significance of a tanzanite engagement ring to a new level. The RG143 claddagh ring is a historic jewel that was first made around 4 centuries ago. The jewel is today regarded as the most meaningful jewel in history and was first crafted by a humble Irish slave. The young man hoped that the unique features in the ring would portray his true love and feelings for her, the ring symbolizes love, togetherness and loyalty ... more. 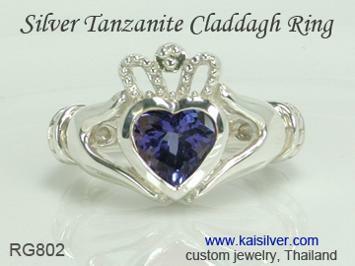 The meaning of the claddagh captured in a well crafted 925 silver tanzanite gem stone ring. The love, togetherness and loyalty theme of the 4 century old claddagh ring, combines with the extreme raity and uniqueness of tanzanite to deliver a tremendous tanzanite engagement ring. The timeless look and feel of silver adds to the beauty of the historic jewel. 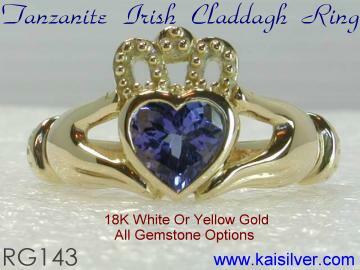 Fine craftsmanship and handpicked gemstones for the gold and 925 sterling silver claddagh rings from Kai Silver ... more. Related Resources: Tanzanite Ring Collection. Men's Tanzanite Rings.